The stock market may whipsaw on the divergence of expectation and realty on economics numbers like the jobs report, although it is baffling why it would do so given how wrong the expectations always are, as well as the inevitability of revisions to the initial numbers. The data is "noisy." The electorate, however, seems to focus on the raw number, not the expectation, and later revisions fail to register. 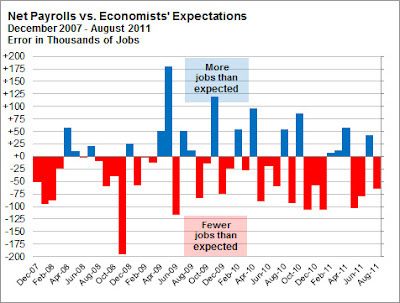 The threshold for what counts as an economically and politically significant jobs report ought to be fairly high. Not every month’s report can or should be a “game-changer.” Indeed, the public has often reacted more calmly to both good and bad monthly jobs reports than the political cognoscenti do. The jobs numbers are certainly not enough to change the basic story of a slow economic recovery, and it will take many years for the economy to get back to full employment. The numbers themselves matter less than the trend, but even that is a poor predictor. My view is that the President has this right: the numbers matter less than whether you believe the underlying policies will or will not continue the right trend. The drop in unemployment alone is no guarantee of re-election — there was also a considerable drop in unemployment in 1976, and Gerald Ford lost. However, the FiveThirtyEight economic index, which accounts for the payrolls numbers along with six other economic data series, would project a narrow re-election for Mr. Obama by about 3 percentage points — similar to Mr. Bush’s margin over John Kerry in 2004. Especially with the Friday jobs report, the economic numbers now seem just strong enough to make the incumbent a favorite for re-election, based on the way the public has evaluated their presidents historically.